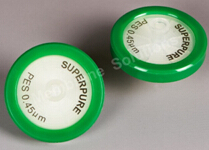 MS® 30mm diameter syringe filters is characterized by color edge design, which visualizes the membrane type directly. The over molding process helps filter stands more operation pressure. The preset GF prefilter speeds the flow rate up significantly. Wide range of membrane options and pore sizes bring with a broader chemical compatibility. All of them are produced with high quality and cost-effectiveness in 100000 clean room under strict QC and QA procedures. 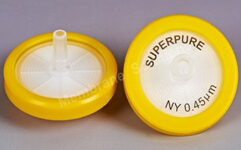 Filter Ø: 30 mm; Filtration area: 4.9cm2, has more than 40% larger filtration area than the 25 mm filter.